Clear Labels let the original look of your products show through your labels, while still representing the time and energy you put into branding your business and products. At the same time, bubbles behind a Clear Label are easier to see than with opaque label options. However, with just a few simple steps you can prevent bubbles or blemishes from sneaking in behind your labels during the application process, and get a professional look for your products every time. When applying your Clear Labels, it’s best to start with a clean surface to remove dust and oils that can prevent your labels from properly adhering. Cleaning the surface with a mild soap and warm water, or quickly wiping it off with a soft clean cloth, before applying your labels, are easy ways to prevent minor blemishes from getting applied right along with your labels. Label application machines come in a variety of styles, from hand-powered options to fully automatic versions. 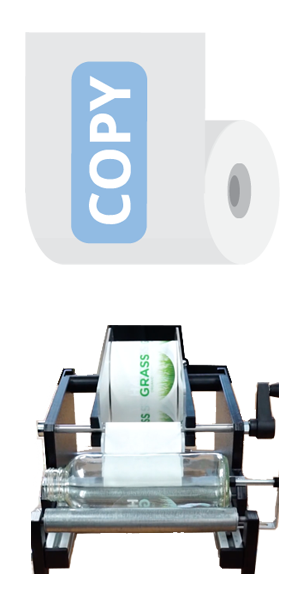 Our Clear Labels can be oriented on the roll according to your machine’s specifications, so your labels will work easily with the application machine of your choice. An application machine is helpful to ensure consistent tension in adhering your labels, every time, and can make some quick work of what can seem like a tedious process in product labeling. When using a label application machine, follow the specifications to align your labels with your products and get started. Your Clear Labels will peel easily from the backing for a smooth application when using a machine. 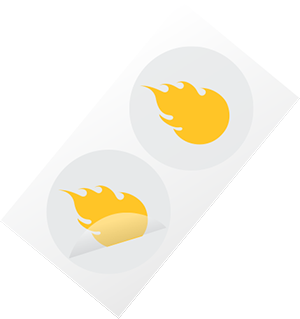 Many of our customers work with a hand application process for their product labeling with great success, and in some cases, it just works best for their needs. Although, have you ever used clear tape, and seen a fingerprint left behind underneath the tape’s surface? Your fingerprints can present the same challenge with Clear Labels. To prevent sending your fingerprints into the world with your products, it’s best to always handle your Clear Labels from the edges. This keeps any potential prints away from your custom design, and open areas in your label where they can easily be seen. 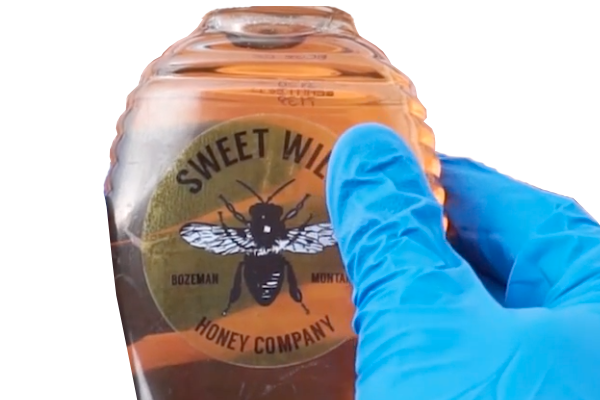 You can also wear thin lint free gloves when applying your Clear Labels, which can also give you more control when applying larger labels, or wrapping your labels around curved surfaces. When applying your labels to a curved surface, such as bottled drink or beauty product, remember to work in a wrapping motion. Start by aligning your label on your product, and applying an edge of your label firmly to the surface. Then wrap your label around your product in a motion which moves with the natural curve of the surface. Working in a steady movement lets your labels adhere to your product surface smoothly, while preventing bubbles or wrinkles in the clear material. 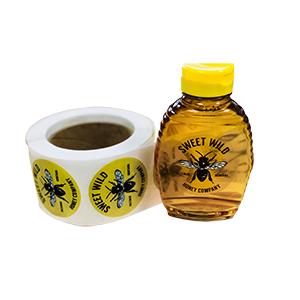 Clear Labels are also an economical way to brand gift boxes, bags, and many other flat surfaces where you want your brand to stick. Best of all you can get many different looks from your Clear Labels, depending on the color of surface they are applied to. When applying labels to a flat surface just be sure to start by applying one edge of your label firmly. Then with a small amount of tension lay the rest of your label into place. Smoothing out your label as the final step makes sure it has properly adhered, and gives you a chance to push out any minor bubbles that may have snuck in along the edges. Plastic cards with flexible edges are also an effective tool at quickly smoothing your labels, and will work best when applying your Clear Labels to flat surfaces. Adhesive labels are an easy way to professionally brand your products, share important product information, and represent the care you put into your business. If you are working with a variety of labels from Clear to Glossy White, or just prefer the clean look of a Clear Label, mastering the tricks of applying your labels will leave you with a professional and clean look anywhere you apply them.